After putting away the Christmas ornaments, and doing other honey-do's around the house. -- I finally got around to getting the radio shack back in shape earlier today. The antennas are back in the trees after the mid December storms had done their damage. I've also added a second flat screen monitor to the main shack laptop computer. 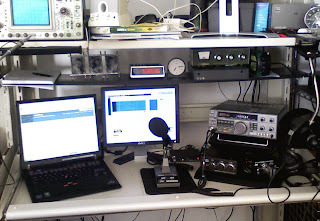 2010 - HAM Radio Planned Goals; More CW, Dixie Pixie Project, and first SDR (Genesis Radio Kit G2030). I look forward seeing you more of you on the radio this coming year. Congrats on the upgrade to Extra! I didn't know! I guess I should get on the radio more often, eh? I look forward to hearing or reading about how you like the Genesis G2030. I'm hoping to try some low power SDR xcvrs in the future. JL, Congrats on your upgrade. Now I will have to do work on it. Best wishes for a happy and healthy new year. Nice looking pic. Looks like you can either talk on the radio or launch rockets.